Play for Keeps is perfect for you whether you want to learn to play keyboard for your own enjoyment or professionally and it is never too late to start. You can join us from 8 years old to adulthood, all are welcome! 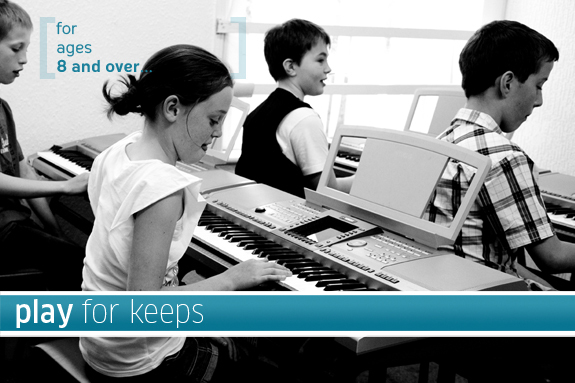 Play for Keeps not only teaches you how to play Keyboard style but also Piano style and students become confident through working in groups in playing in a Solo environment as well as in a Band situation. You will also have the opportunity to arrange music in your own style and learn how to improvise. The music in the course covers a broad range of genres with a focus on Popular Music from Rock and Roll through to the present day. We make sure you get to learn the styles of music you want to be able to play, so there’s never been a better time to learn to play the keyboard! Band Playing is included in every lesson which enhances your ability to play with other people just like a professional musician. When arriving home with your new book you are provided with a CD of backing tracks to accompany all of the songs that you have learnt in your lesson. This creates an exciting way for you to practise alongside your own Band at home! In the lesson you will not only learn how to play music but be able to notate it, learn about music theory and also develop your aural and improvisation skills. This gives you the tools to be able to hear music and be able to transcribe and play it, helping you to be able to listen to your favourite song and work it out for yourself! We will also teach you Music Technology skills which will enable you to multi track record and sequence plus be able to use a pitch bend and modulation wheel to enhance performances. Book a free taster lesson on Play for Keeps in order to experience this fantastic course for yourself.